Bobbi Foudree started dancing at the age of 16 with Kim Shope and soon thereafter wished to pursue a career both in professional dance and as a dance teacher. She continued her studies at Stephens College in Columbia, Missouri where she took pedagogy and performance classes and completed her B.F.A. in dance. Ms. Foudree spent her summers training at various ballet summer programs including Nashville Ballet and Ballet Chicago. After completing her dance degree Ms. Foudree moved to New Hampshire to dance with Northern Ballet Theater and Jennie and Company. 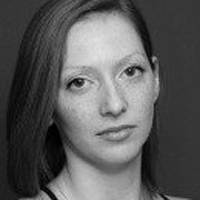 During her time with Northern Ballet Theater Ms. Foudree had the honor of being both a teacher and director for Northern Ballet Theater 2. Missing the Midwest Ms. Foudree returned to Kansas City and Danced with Kacico Dance, Aha! Dance Theater, Reach, The Smith project. 940 dance company and currently is a company member with City in Motion Dance Theater. Ms. Foudree truly lives for teaching dance and has loved every Summer program and school year class at Kansas City Young Audiences!